Last Sunday was a day to remember for Aditi. First, she had her first ever unparented swimming lesson. Very exciting for her, and brilliant for me, as I sat on the side and shot the breeze with other mums. She loved it, and had a lot of fun, and made friends so very quickly. I felt a little bit excluded, as I realised that my baby girl is growing up, and before I know it, she will be getting her first tattoo (gah!) and leaving home... but that's how life is, and we all live and learn. The second exciting thing to happen was that she got her first ever bicycle. Its purple, with butterflies on it, and she has a matching helmet and knee pads. We had a crazily happy child, as we taught her how to ride up and down the pavement, ignoring our aching backs, of course. The more I think about it, the more I understand what a huge responsibility having a child is. Not only are you responsible for their physical upbringing, but also for their emotional stability. And the necessity of giving them a childhood they can remember all their lives. For the last year or so, I have been a stay at home mum, obviously more out of need than choice. Now, its getting closer to the time that I will be getting a full time job, and going back to balancing work, home and life. I realise I am going to miss being at home with Aditi and enjoying her growing up, and being there for all the small milestones. Like, getting a bike. Or having a picnic with all her 'animals' (Little Bear, Aiden Bear, Russ Bear, Mopsy Doll, Froggy and Bunny Bear (don't ask!!)) Or spending afternoons wrestling her for 'quiet time'... or bribing her with biscuits. Well, now that I have got that melancholy meander out of the way, it was an exciting day for me too. I am posting my very first ever challenge for the Daring Kitchen. I had an idea of what I wanted to make almost straightaway. When Kay and I first set up our home, my parents-in-law gave me a really nice cookbook from Homestyle called 'Vegetarian' I haven't actually seen any authors for this book, but the recipes are really lovely, and have turned out well everytime I've cooked one. 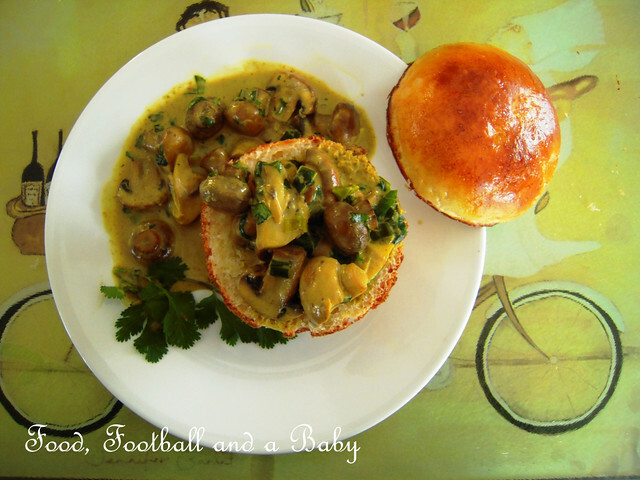 The recipe that inspired this post was 'Mushrooms in Brioche', basically mushrooms cooked in a creamy garlic sauce, and stuffed into brioche rolls. It sounded delicious, and I wanted to try it out, but with my own twist. 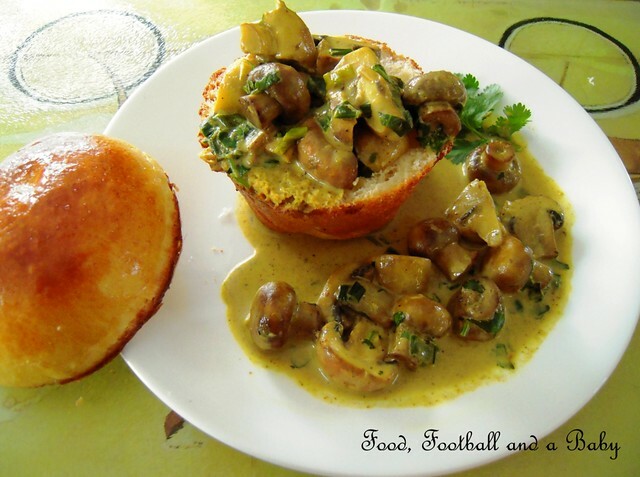 So I decided to make my own brioche rolls, and give the mushroom filling an Indian twist. I made the mushroom filling in less than 30 minutes, including prep. It turned out really lovely, creamy and fragrant with just a gentle hint of spice. I used the homemade Madras Curry Powder that I had made a few weeks ago, and the fresh spice really made a huge difference to the overall taste. I can easily see us having this with some plain rice as an easy weekday meal as well. In a saute pan, heat the oil and butter on a medium heat. Add the garlic, curry powder and ground turmeric and fry for two minutes, stirring well. Add the mushrooms and spring onions, and cook, stirring well for another 3 - 4 minutes, until the mushrooms are well coated with the spices. Add the hot stock to the mushroom mixture, and cook for another 3 - 5 minutes, until the mushrooms are cooked and tender. Add the cream, little by little, stirring. Stir together, then add the whisked cornstarch. Stir in half the fresh chopped coriander. Slice the top off the cooled brioche roll, and keep aside. Pull out a little of the bread, and hollow out, so you have a little container. Fill with the mushroom mixture, letting a little bit spill over the sides. Sprinkle a little more fresh coriander on top of the filled brioche roll and serve warm with the 'lid' on the side to soak up any sauce. 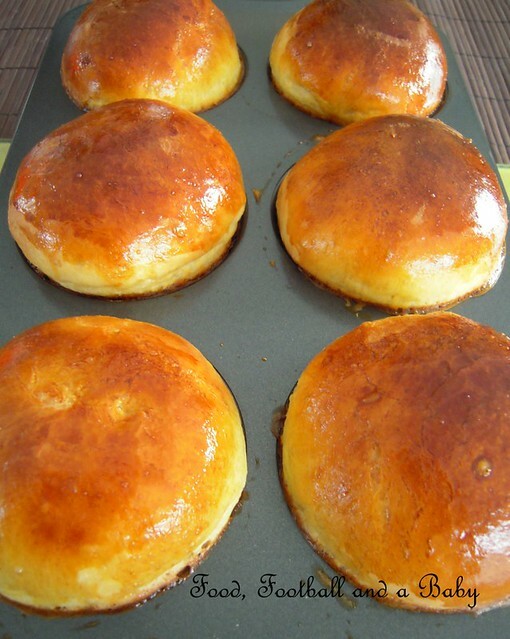 The brioche rolls are making me hungry Michelle! Hope you've saved some for me :) slurp! 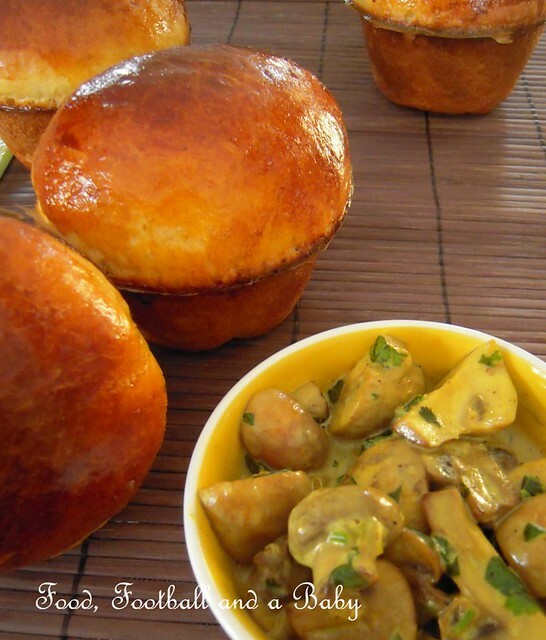 Mushrooms in Brioche they look so delicious and brioche goes so well with mushrooms fabulous choice outstanding work. Well done. Oh my goodness, this looks absolutely beautiful! A delicious combination that I've saved to try soon. Good job! @Dom, thank you :-) I must admit this was my first time making brioche, and apart from the horror at how much butter went into it, we absolutely loved it. And also, here's a little secret. I made the dough in the bread machine... on the dough cycle. It worked out really well, and hardly any mess to clear up! @Audax, thank you. It means a lot coming from you... this is my first time so I was pretty nervous... but every one has been just so lovely. @Suzler, thank you and I appreciate you taking teh time to drop in. 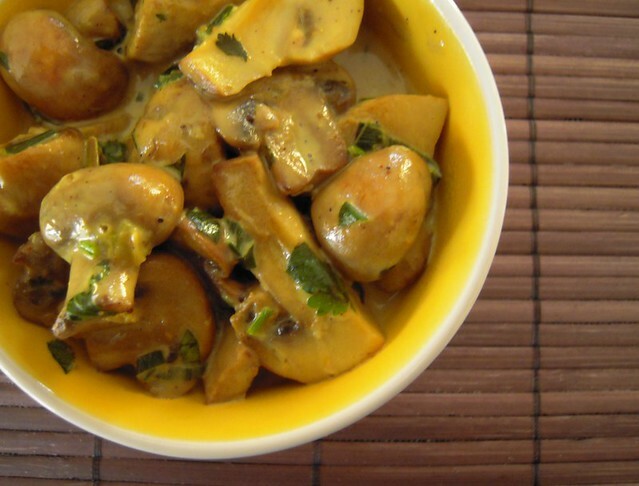 That mushroom filling sounds fantastic with the curry. It looks really good in the brioche - a little more elegant than the normal bread bowl. Oh my, the mushroom filing looks positively delicious! I can't wait to try it. @Todd, thank you. It worked really well, and I was pretty happy with it. This looks SO incredible! What a neat idea to fill brioche buns, only the richest, yummiest bread ever, with a decadent mushroom filling. That's heaven! Phenomenal job! I'd like to comment on your blog recipes, but I can't see a comment form... am I doing something wrong? These brioches look professional! I'm impressed, and the mushroom filling you chose pairs just perfectly. Amazing job on the challenge, thanks for your participation! Um.... you *do* realise that giving her a bicycle gives her an easier means to get to the tattoo parlour, right? Beautiful dish! Mushrooms and butter make such happy partners so surely mushrooms and buttery brioche are a match made in heaven. Creamy, creamy heaven. I love your answer to this challenge. The mushrooms look so tasty as well. These are amazing and look totally delicious. I was wandering how you managed to get the filling into the raw dough - then realised you actually added the mushrooms after the brioche had cooked - it's late and I've had a busy day - that's my excuse anyway! It must be very hard being a mother and having to go out to work when you'd rather be at home. Mmm I love mushroom everything! I'll have to try this asap! 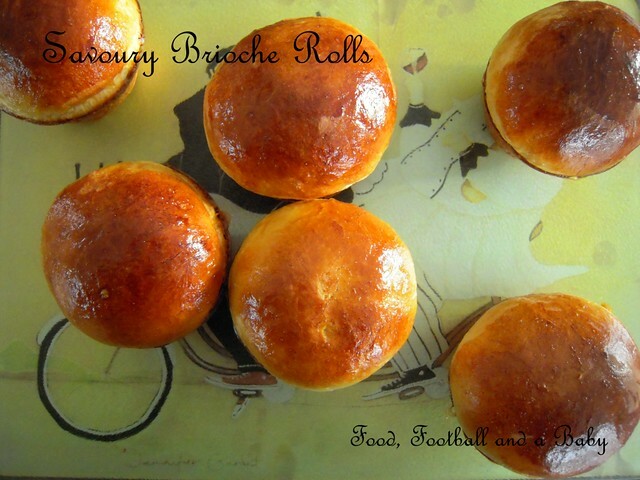 These look gorgeous, I love the sound of savoury brioche, these would be perfect for brunch.